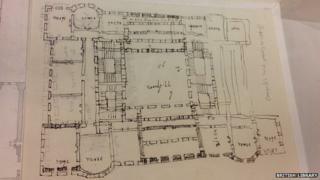 An eccentric architectural plan thought to have been drawn by George III during his period of "madness" has been discovered at the British Library. It is part of a huge collection of papers put together by the King during his reign from 1760 to 1820. The loose piece of paper was tucked inside a volume about the Palaces of Hanover in Germany. The diagram of a building was drawn in ink over a pencil outline "in a rather savage way", according to experts. Peter Barber, head of map collections at the British Library, said the drawing, scribbled on the back of an order of service from St George's Chapel in Windsor, was "not an ordered plan". "You see certain things which are at the very least odd and actually rather disturbing," he added. A grand central courtyard with no obvious means of access, surrounded by no fewer than four monumental staircases, was "perhaps a little excessive, even for a Baroque monarch", Mr Barber said. Meanwhile, some of the rooms have no doors at all, and there is no way of getting from one room to the next. Mr Barber concluded that it was drawn when George III's mind was disturbed. Numerous theories have been given for the sovereign's "madness", from the blood disorder porphyria to episodes of mania corresponding to Bipolar depressive illness. "It may be a unique survivor of that traumatic period of his life," he said. Martin Clayton, head of prints and drawings at the Royal Collection Trust, agreed. He said the "style" of the drawing was the strongest evidence that it was by George III, being very similar to many other "scribbled architectural plans" made by the King. "It's enthusiastic, it's slightly obsessive in places. And the obsessiveness does suggest that it was probably the work of George III around 1788 or 1789 when he was recovering from his illness." The handwriting also strongly resembles that of the monarch. Mr Clayton believes the plan was a study for the re-development of The White House at Kew, one of a string of royal residences around Richmond and Kew that were built during the 18th Century. He said contemporaries reported that the King spent a good deal of time "drawing plans somewhat manically for rebuilding the house, while recovering from his first serious illness". The architectural floor plan is part of the King's Topographical Collection. He was a keen armchair traveller, fascinated by geography and a passionate collector. He brought together more than 60,000 maps, views and watercolours from all over the world, particularly Great Britain and the British Empire. There are some of the earliest views of Canada, created on birch bark, and there are the first known watercolours of Sydney to be painted by a professional artist. It also contains a map of New York that was presented to the Duke of York to celebrate the city's capture by the English from the Dutch in 1664. It was, according to Peter Barber, "the birth certificate of New York". The collection also includes highly sensitive and secret government documents for English fortifications around the world, which Mr Barber says should not have been in the King's possession. "Had they been discovered, England would have been in danger," he said. "They would be sent to him for approval, he would see something interesting and, I think, without asking anybody, he would simply keep them for himself." "This collection in this way, really gives a key to understanding how George III interpreted kingship. He is intentionally bringing together information for his own use, independent of his ministers", he said. It was, in other words, "his database". But the collection does not just present a picture of Georgian society from the very top. It contains all sorts of items relating to everyday life, including adverts for the first wire railings and even an advertisement for a "bun house", a shop which sold Chelsea buns. The collection also includes one of the greatest surviving parts of the archive of the architect Sir Nicholas Hawksmoor, together with plans for his churches in east London, including Christ Church in Spitalfields. Yes despite its treasures, the collection is virtually unknown. The British Library is hoping to raise £1m to catalogue it for the first time and put it online. "Most people are totally ignorant of the existence of this collection," said Mr Barber. "And it's going to be a tremendous surprise and a tremendous resource for people, throughout the world."